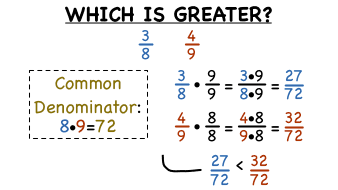 How Do You Compare Fractions by Finding a Common Denominator? Ordering fractions from least to greatest? Don't have common denominators? Find a common denominator by multiplying the denominators together. Use that common denominator to create equivalent fractions. Then, compare the numerators to figure out which is bigger! This tutorial shows you how! How Do You Put Fractions in Order Using an LCD? Ordering fractions from least to greatest? Don't have common denominators? You could find the least common denominator (LCD) of the fractions and write equivalent fractions with this LCD. Then, compare the numerators to figure out their order from least to greatest! This tutorial shows you how! How Do You Compare Fractions by Converting to Decimals? Comparing fractions with unlike denominators? You could convert each fraction to a decimal and compare the decimals on a number line. Check out this tutorial to see how you can compare fractions with unlike denominators!